Today is a 100 year anniversary in Florida, especially Key West. It's not about pirates or Hemingway or conch shells. Jan 22, 1912 marks the date that Henry Flagler, at the ripe age of 82 finished the Florida East Coast Railway Extension from Homestead/Florida City to Key West. The construction was an engineering feat and a dream come true, not just for Flagler but Floridians as well. During this Gilded Age in America, anything seemed possible. The skyscrapers that sprouted in New York, illuminated by newfangled electric lights. And in South Florida, Henry Flagler built a railroad over the ocean. The 128 mile extension, about 19 miles of it over water, was considered by some as the Eighth Wonder of the World. The task took eight years and up to 10,000 workers and $50 million to complete according to the local paper. Some herald Flagler as the Godfather of Tourism thanks to the train. But Flagler was a business man with bigger goals. 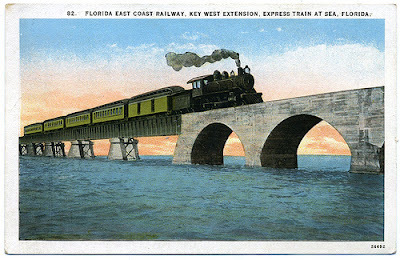 Flagler's sights turned to Key West with the prospect of garnering freight for his FEC Railway from the construction of the Panama Canal and from increased trade with Cuba. Once this oil tycoon laid down tracks down the east coast, developments sprung up. In 1895 only nine people lived along the Miami River according to Paul George, a historian at Miami Dade College. But that was before Flagler choo-chooed into mosquito swamp land. Soon after his railroad passed through Miami, the city was incorporated in 1896 with close to 800 residents. But this "wonder" that carried three passenger trains and two freight trains daily, suffered back-to-back blows. First the Depression. The company declared bankruptcy in 1931. Traffic on the railway waned. Then the monstrous Labor Day hurricane of 1935 destroyed the bridge. The FEC company, barely able to afford its gas bills, could not rebuild. A highway was later built on the railway right-of-way. Throughout the year, the extension's anniversary will be celebrated along the FEC line from Palm Beach to Key West. The Florida Pioneer Museum at 826 N. Krome Ave in Florida City has a small collection of FEC memorabilia ranging from actual slices of the track, spikes and tools used in the extension to dining car dishes and utensils and 25 photos taken from postcards touting the construction of the extension. The museum is open free of charge on Wednesday and Saturday from 1pm to 5pm with volunteers to assist with the story. For more information, call 305-246-9531. To view a slideshow of original photos from period of construction, click this link. Just another slice of history in my Fabulous State of Florida!